Reining on Rhett was quite the journey....it began in the late 1980s, when my very dear friend Amy Tremper took a few months to be an assistant trainer for Tim McQuay, one of the most winning NRHA reiners ever! She was interested in learning more about reining, and wanted to bring it back to Santa Fe NM for the rest of us to enjoy! and now their 8 year old son, Cade McCutcheon is winning too! It was when Amy was at the McQuay stables that she met Dr.Ralph Johnson, DVM, the one time neighbor of the McQuays when they still lived in Minnesota. Dr. Johnson's veterinary acupuncture (which he practiced from 1983 until his retirement in 2005) is what saved our horses, and those treatments are still doing the trick!! 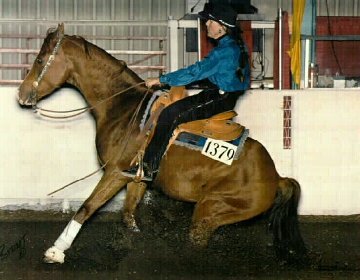 It allowed me to do reining on Rhett for several years. Here is Rhett as a baby in Tucson; he still has that same sweet baby face!!! 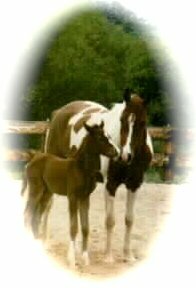 When i got my darling Rhett (Baskips Amarhetto), 3/4 Arabian, 1/4 Quarter Horse, we began reining lessons with Barry Bader. Luanne and I would take the drive south of Albuquerque to the Bader Stables in Peralta NM was long and a hassle with the traffic, but we sure loved our what we were learning about reining! Reining with Rhett was one hobby I will always be thankful for! What a day it was when Dell Hendricks & his wonderful wife Terri moved to Santa Fe!!! 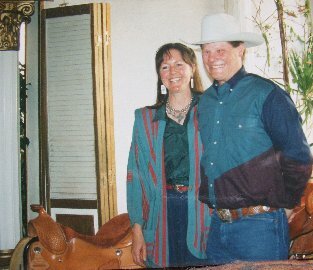 Pat and Jim Warren built Rancho Oso Rio (now the home of the Santa Fe Horse Park), so we all started taking our reining lessons from Dell! Dell sure loved Rhett's wonderful, willing, Arabian heart, and his natural sliding stop! Rhett won the very first New Mexico Reining Horse Assoc. ''Green as Grass'' buckle, and the 1993 Non Pro Trophy Saddle! Reining on Rhett, what a blessing!! Reining with Rhett was even more fun with his new Non Pro Reining Trophy Saddle! Scrapper, my most beloved Australian Cattledog, loves the saddle too!! And she LOVED to ride horses!! Here is a photo of Dell doing one of his famous, huge sliding stops, usually scoring +3 or more! Reining was very hard on Rhett, but with the help of acupuncture and some fabulous Food Supplements, he has had Excellent Joint Healing! For years, we'd pile in the car and go to the NRHA Futurity in Oklahoma City, spending hours and hours every day watching the fabulous classes. As the Futurity drew near, we would stay up late and watch the Open Reining Finalists do their warm ups and run throughs; what a great learning experience that was!! Fabulous memories with some of my dearest friends, Luanne (pictured here with her Reining horse, Lady), Celeste, Libby, and Kay. Now we can watch all of it streaming live on the internet.... always dreamed of reining on Rhett at the Futurity, but it was not to be. A Must-Watch is this youtube of Shawn Flarida winning the 2002 NRHA Futurity on Wimpys Little Step with the highest score ever, or at least to date .... 233!! Shawn married his high school sweetheart, and they have 3 great kids. And now, the daughter of Wimpys Little Step --- NRHA Champion Shawn Flarida's winning ride at the 2007 Futurity. Riding Wimpys Little Chic a mare out of Wimpys Little Step and Collena Chic Olena. Shawn Flarida scores a 231 in his fourth Open Futurity win, WOW WOW!! 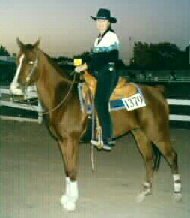 Photo of reining on Rhett at the Arabian Nationals, Albuquerque, 1995, where we received the Top Ten Trophy & ribbon, and were awarded 4th place, beating out many big named reiners! Reining on Rhett has now morphed into slogging thru deep snow, trail riding, and in general having a lot of fun at home. At age 22, Rhett deserves the best relaxing and enjoying life! !